People from more than 97 countries have answered four questions to explore their visions for a better world. After the first analysis of the answers, the three words that came up over and over in all world regions (in order of importance) were: HELP - LIFE - CHANGE. Creative people from around the planet are now setting up to launch a global renaissance of art and music on December 20th to help life change… for the better. Join us. 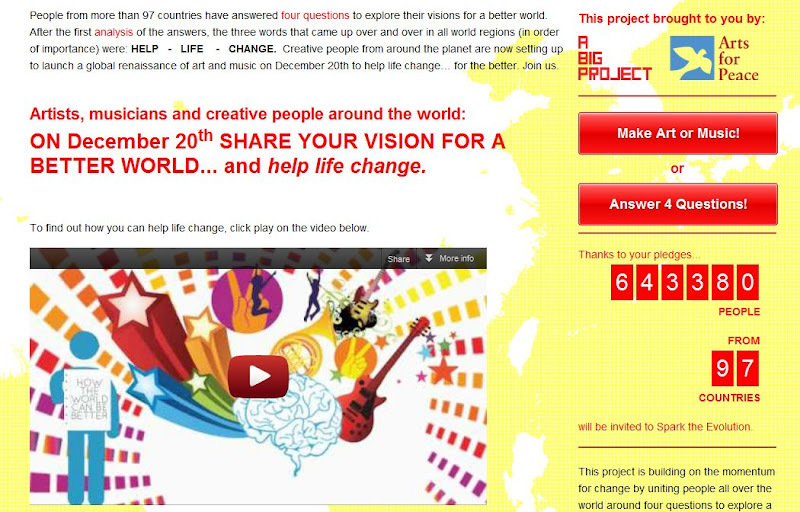 ON DECEMBER 20TH, SHARE YOUR VISION FOR A BETTER WORLD… AND HELP LIFE CHANGE! People in over 97 countries are initiating a global renaissance of art, music and performance on Dec 20, 2012* to express their visions for a better world and to help life change, for the better. We’ll share your creative project through websites, radio, television, newspapers and a network of over half a million people in every region of the globe. *Dec 20th is the day before the Mayan calendar predicts a global shift towards a more humane society. We are using this day as a rallying point, and do not endorse the prediction as true or false. But by uniting to express all of our visions for a better world on a day when people everywhere are talking about global transformation, we will have the collective power to help life change. Lovely work and lovely thinking. I think this is not only for Maya or something other culture prediction but its a message to the world also that we need to be together on every moment. Why to wait for such a calamity? Do we need to? No... we have to grow and let others grow. I support your program from the depth of my heart.